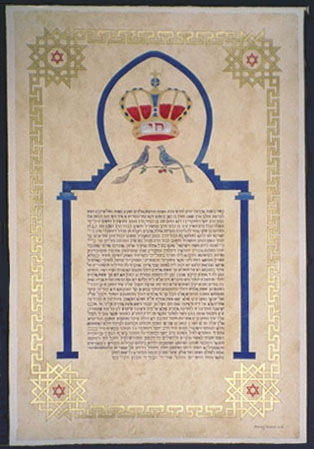 The Ketubah is written on a the "parchment" background. The Sephardi Orthodox text in blue compliments the Moroccan blue arch. In the arch is a Torah Crown with red velvet colour and a silver details with Chai written in the middle. Below the Torah Crown are two delicate Peacocks resting on a Pomegranate branch, symbolizing Prosperity and Abundance. The outer frame is in gold paint and in the four corners are red Stars of David.